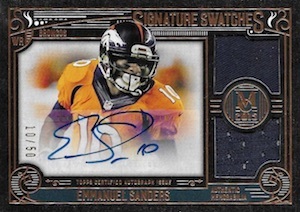 2015 Topps Museum Collection Football continues the tradition of the high-end brand with four hits per box. Each box of the hobby-only product includes one on-card autograph, one autograph relic and two relic cards. The 2015 Topps Museum Collection Football base set features 100 subjects across the past, presents and future of the NFL. A handful of parallels offer more options for collectors with Copper, Sapphire (#/99), 60th Anniversary (#/60), Amethyst (#/25) and Emerald (1/1). 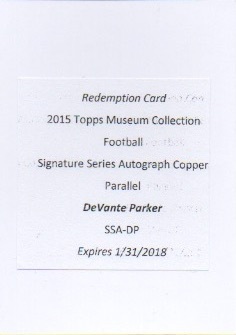 Autograph cards come in many forms in 2015 Topps Museum Collection Football and the on-card options should be especially popular. Signature Series Autographs feature hard-signed cards with limited parallels, including Copper (#/50), Gold (#/25), Silver Ink (#/5), Gold Ink (#/5), Emerald (1/1), 60th Anniversary (1/1). Doubling the total, Dual Signature Series Autographs are serial numbered and offer Silver Ink (#/5), Gold Ink (#/5), Emerald (1/1), 60th Anniversary (1/1) parallels. Super Bowl Signatures Series (#/10) focus on the top players to win the big game and add a sticker signature. There is also an Emerald (1/1) parallel. Continuing the on-card autographs, the popular Museum Collection Framed Autographs return with an ornate design and multiple tiers. The base Silver Frame cards include silver ink and the Gold Frame parallel feature gold ink with a print run of ten. Both numbered one-of-one, Black Frame (silver ink) and 60th Anniversary (gold ink) are the rarest versions. Among the many autographed relics, Museum Jumbo Patch Autographs feature the top rookie subjects. Signed on-card and numbered, there are also Copper (#/15) and Gold (#/10) parallels that include a multi-color patch and an Emerald (1/1) parallel with a Swoosh logo patch. 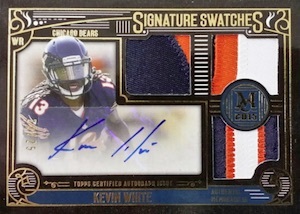 Signature Swatches Triple Relic cards include a trio of jersey pieces with an autograph. 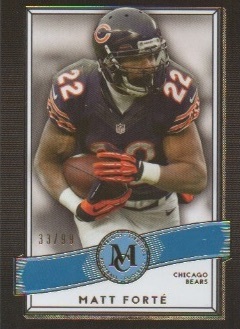 Again, Copper (#'d), Gold (#/25) and Emerald (1/1) parallels are available with patches. 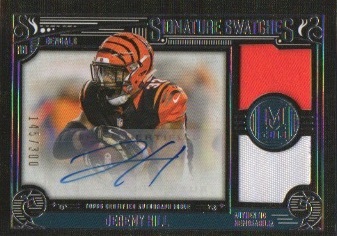 Similarly, Signature Swatches Dual Relic pair a jersey swatch and patch alongside an autograph. 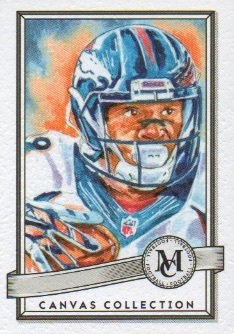 Parallels include Copper (#/50), Gold patch (#/25) and Emerald multi-color patches (1/1). Pro Bowl Signature Swatches Dual Relics honor the players named to the yearly NFL All-Star game with a swatch, patch and autograph. Copper (#/25) and Gold patch (#/10) parallels add to the total along with several Emerald parallels (1/1). This includes multi-color patch, team logo patch and Pro Bowl logo patch versions. 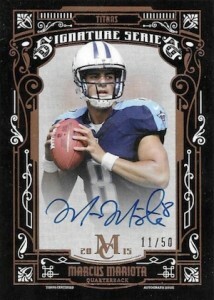 Relics remain a key component of 2015 Topps Museum Collection Football and collectors are treated to a large variety. Jumbo Relics and Pro Bowl Jumbo Relics both come in Copper, Gold patch and Emerald parallels. 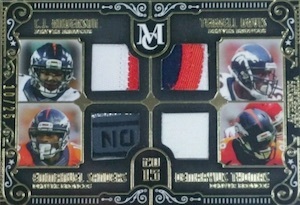 Jumbo Logo Relics, Laundry Tag Relics and NFL Shields are all one-of-one memorabilia card inserts. Dual Jumbo Relic Book Cards combine two players with a print run of five. 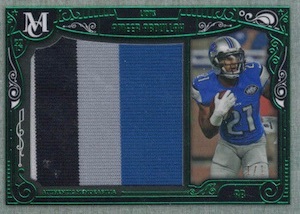 There is also an Emerald patch parallel (1/1). 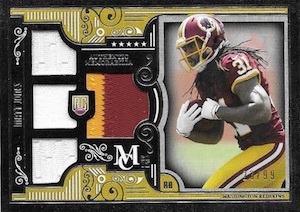 Quad relics are another key part of the relic inserts in 2015 Topps Museum Collection Football. 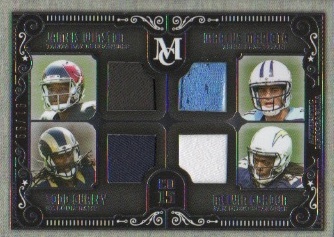 Rookie Quad Relics (#'d) include three jersey pieces and one patch piece. Museum Combo Quad Relics (#'d) showcase two players and four jersey swatches. Both quad relics are also found in Copper (#'d), Gold patch (#/25) and Emerald multi-color patch parallels (1/1). Pro Bowl Quad Relics (#'d) feature three jersey swatches and one patch and include Gold patch (#/10) and Emerald multi-color patch parallels (1/1). Once again, the Canvas Collection insert line is prominently featured with one insert per box. Canvas Collection Originals (1/1) are the hand-painted versions of the insert. 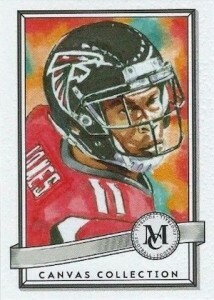 Vintage Canvas Collection honors the top rookies with paintings showcasing them in leather helmets. The cards average one per case and also include the 60th Anniversary logo. Vintage Canvas Collection Originals provide one-of one artist paintings while Vintage Canvas Collection Relics (#/5) add a jumbo leather helmet relic. Both Canvas Originals versions also can be found in signed versions (1/1). Lastly, Oversized Framed Autograph Patch Cards include an on-card signature and premium patch. There are also versions that incorporate glove logos, draft hats and jersey team logo patches. 35 cards. 1 per box. Good: Four hits per box, guaranteed on-card autograph, Framed Autographs. Bad: Some sticker autographs, lots of one-color jersey pieces, high price point. The Bottom Line: If you are breaking Museum Collection, you should already know what you are getting into. It is is a very risky product by the box but can yield some huge hits. The price point is hard to stomach, but the overall risk/reward can be justifiable. Museum Collection generally sticks to tradition with regards to design and this is the case in 2015 as well. 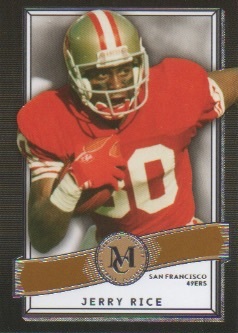 The base cards again showcase an admittedly simple look, but the classic design and quality works for me. 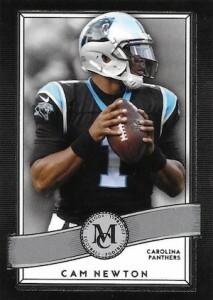 However, I am not a fan of the huge black border that feels a little lazy and dominates the card. Essentially featuring the base design with the sketch image set inside, the Canvas Collection Reprints do a great job of throwing in a little variety and could easily pass for an actual sketch. These remain a quality addition. Beyond this, the rest of the cards in the release fall into the hits category. The more common the rookie “relics” become, the harder it is to be excited for them. The Quad Relics feature very tiny swatches while the jumbo relics work with much larger pieces. While this is nice, the three cards I pulled that included relics were all numbered and still only offered single-color pieces. I realize they can’t all be amazing patches, but if they cannot even provide the specific origin, at least wow me with a decent relic. Without question, the top designs are the Signatures Series Autographs and case-hit Framed Autographs. Both feature on-card autographs and an appealing look but the Signature Series does suffer from the dark border like the base set. At least it throws a little design into the border. Signature Series Swatches are less exciting with the sticker autograph. While the Dual Relic version I pulled looks okay, the Triple Relics come across very cluttered and the compartmentalized image is awkward. Like most of these higher-end releases, there is a heavy focus on rookie content, but collectors can still find second-year and veterans alongside all-time greats. All things considered, the checklist is solid but not amazing. One potential cause for concern is that there are actually some fairly high print runs for some of the Autographed Relics, including numbering into the 300-400 range. A classic gamble, the value in 2015 Topps Museum Collection Football ultimately comes down to how much you can spend chasing it. Sure, there are huge hits to be found, but at two autographs per box and prices running $175+, it comes with a lot of risk. The guaranteed on-card autograph does help some and can also be the saving grace. This was the first time I have ever opened a box of Museum Collection Football and I found it exciting. 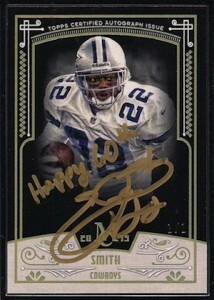 The redemption in place of the on-card autograph was disappointing and so was the relic quality. Having said that, I appreciate the understated elegance of the release and I am somewhat sad to know this is the last edition for the foreseeable future. 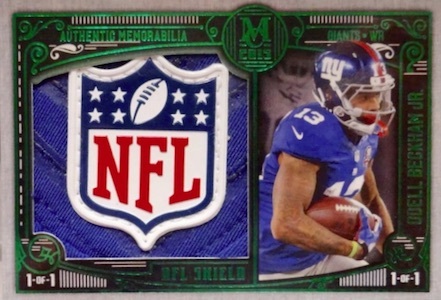 This product is producing some straight up nasty patch/patch auto cards. Love the overall card design. One question….does every other box have a Gurley patch or patch auto…lol. Just seen a lot of them pulled!!!!! 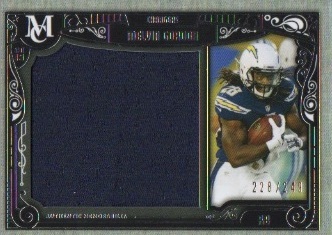 With it’s high price point having 2 of the four cards jersey cards just doesn’t cut it, especially the one color jerseys. Averaging about $50 per card, all the cards should be autos! Sure you can hit the $300+ card, but many cards are $2 cards! Not worth the bust; Just buy the cards you want and let someone else take the loss. Bought two boxes and probably ended up with about $75 worth of product total. Of course you get nice cards but the quality of the players is the most important. With high end products they need to make sure of what’s inside. The box above is probably worth about $45 on ebay. Not good.